Sticker charts have been used for everything from potty training to doing chores. Perhaps you used them as a child, or with your own children, to focus on homework, bathing or good behavior. It can take a while for kids to learn how to care for their bodies, become aware of their actions and keep track of their belongings, and sometimes they need reminders once they learn. 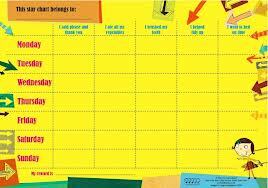 A sticker chart can be a fun way for children to learn and develop good habits. It also teaches children how to create routines that they will use in adulthood. At the end of each week, or when a child gets a certain amount of stickers or stars, they usually earn a reward. I highly suggest that the reward be non-food related. For reward suggestions, read Rewards for Kids and Teens. While you are at it, you may want to make a sticker chart for yourself. It could include exercising or some form of physical activity, eating 5 or more servings of fruit and vegetables, daily meditation, reading for 20 minutes, journal writing, going to bed by a certain time, or any other healthy habit you want to focus on. Have fun with it, praise each other for your efforts during the week, and remember to reward yourself too!